The map of Mount Everest of 1988 is the result of a joint project of the National Geographic Society and the Henry S. Hall Jr., Everest Fund of the Museum of Science, Boston. Project leader was Brad Washburn. Swissair Photo+Survey Ltd. and the Federal Office of Topography (swisstopo) performed most of the cartographic work. The matching relief has been airbrushed by swisstopo cartographer Paul Ehrlich on silver bromide in 1987. The map itself was included in the National Geographic Magazine Vol. 174, No. 5 in 1988. “Mount Everest” (section) © National Geographic Society, original scale 1:50,000 (size 60 x 93 cm), 1988. In 1991, a second edition of the map was published with a new reverse by the Boston Museum of Science and the Swiss Foundation for Alpine Research, showing and describing 43 different routes of first ascents of Mount Everest and its neighbouring peaks between 1953 and 1990. MapCarte 42/365: Mount Everest by the National Geographic Society, 1988. Blog entry by Kenneth Field, 2014. 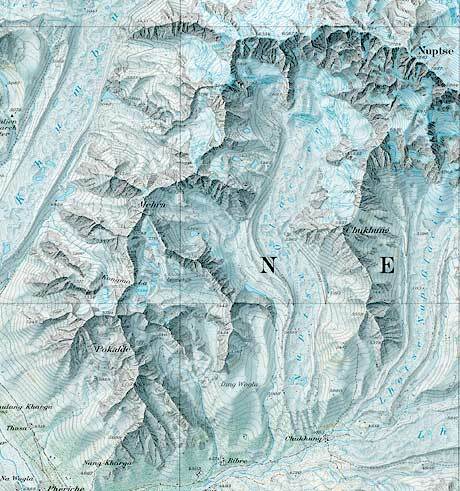 Everest: Part II – The Later Maps by James Hughes, 2009. Thank-you letter to the involved cartographers, 1991 (pdf). Mount Everest Map: Zoom in, by National Geographic. High-resolution 3D modelling and visualization of Mount Everest by Armin Gruen and Shunji Murai, ISPRS Journal of Photogrammetry & Remote Sensing 57 (2002), 102-113. (pdf).